John Higgins, direc­tor of the Chef School at George Brown Col­lege in Toronto, lists some rea­sons addic­tion thrives in the heat of a pro­fes­sional kitchen: Long hours, the pres­sure of pro­duc­ing good work in a short time, the adren­a­line rush, easy access to alco­hol and the fact that sen­si­tive, cre­ative types are often attracted to this job. "Your body is not a tem­ple, it's an amuse­ment park. Enjoy the ride." Recently, I watched an episode of Anthony Bourdain's food-and-travel TV show No Reser­va­tions in which he imbibed copi­ous amounts of what he deemed excep­tion­ally good wine at a restaurant in Croa­tia. The show ended with him falling off a chair and lying on the ground -- seem­ingly comatose. The elo­quent, urbane and emi­nently watch­able Mr. Bour­dain makes no secret of his past strug­gles with addic­tion. A heroin addict for sev­eral years, he has writ­ten about use of mar­i­juana, cocaine and other sub­stances dur­ing his roller-coaster career as a chef in New York kitchens. He also chain-smoked on his TV shows until the birth of his young daugh­ter. It is obvi­ous he still enjoys alco­hol and not in moderation. Bour­dain burst on to the lit­er­ary and food scenes in 2000 with his bril­liant, ground-breaking book Kitchen Con­fi­den­tial. 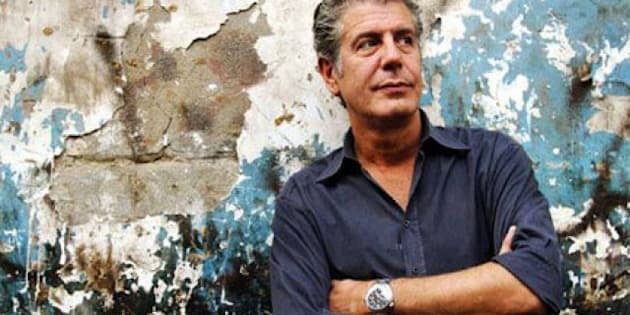 When I inter­viewed him for the Toronto Star at that time, he told me the life of a chef is "day after day of mind-numbing rep­e­ti­tion. It takes a cer­tain type of lunatic to crave that kind of life." A life he com­pared to "serv­ing on a sub­ma­rine" because of "the enforced close­ness, pres­sure and isolation." On a panel with Bour­dain a few years later at the South Beach Wine & Food Fes­ti­val was Jonathan Eis­mann, a chef who has since lost his three Miami restau­rants after a tragic 2012 hit-and-run acci­dent in which he killed a pedes­trian. Eis­mann talked about drug use among chefs. He described how kitchen staff were affected by "dif­fer­ent drugs that react at dif­fer­ent times of the night. First, the pot­heads cut them­selves. Soon the coke­heads were a dis­as­ter and even­tu­ally the junkies stood like stone stat­ues at their stations." I was reminded of all this recently when an Ontario celebrity chef with a top-notch rep­u­ta­tion tem­porar­ily dis­ap­peared with­out trace or expla­na­tion. There were hints in the media that the pres­sure of his job and life in the stress­ful hos­pi­tal­ity indus­try -- along with some kind of addic­tion -- may have been the reasons. I dis­cussed this with John Hig­gins, a well-known chef who spent many years in the indus­try and is now direc­tor of the Chef School at George Brown Col­lege in Toronto. In the strong sing-song brogue of his native Glas­gow, Hig­gins gave his take on the topic at hand. He lists some rea­sons addic­tion thrives in the heat of a pro­fes­sional kitchen: Long hours, the pres­sure of pro­duc­ing good work in a short time, the adren­a­line rush, easy access to alco­hol and the fact that sen­si­tive, cre­ative types are often attracted to this job. In a nut­shell, he con­firms the the­ory espoused by Bourdain. "Peo­ple think cook­ing is easy," he begins. "It's not all Food Net­work -- it's a high pres­sure job with long hours." Hig­gins notes that some chefs use drugs or alco­hol to help "come down" from the adren­a­line rush of that stress­ful syn­drome: You're only as good as your last dish. "Some cooks want to go and party hard and you do that for four or five years and it becomes the norm." He con­tin­ues: "The high that you're on because you're busy, you've really been mov­ing and you're being suc­cess­ful and you're being cre­ative and you're mak­ing peo­ple happy, it's like wow, wow, wow -- it's like Dis­ney­land for kids." His anti­dote is rais­ing aware­ness of these haz­ards among peo­ple enter­ing the pro­fes­sion. He rec­om­mends plan­ning one's career and stay­ing focused on that plan. And, most impor­tant, hav­ing a men­tor. His advice: "Get a job work­ing with the best per­son you pos­si­bly can and to go world­wide whether it's at a fast food place, the Ritz Carl­ton or the Bel­la­gio in Las Vegas." "Every­one needs sup­port," says Hig­gins and cites his wife. "She tells me what real­ity is. It's respect as well," he adds: "It's a tough, tough busi­ness with crazy hours." Hig­gins has strug­gled with his weight over the years and being a chef can be haz­ardous. These days, he finds walk­ing his dogs and going to the gym are great stress-relievers that offer phys­i­cal exer­cise. They give bal­ance in his life: ""I know when I have a bal­anced life, my weight is good." French-born chef Marc Thuet knows all about drug addiction. Talk­ing in his grav­elly voice, he openly -- and coura­geously -- tells the story of his long-time strug­gle with it and of his ongo­ing recov­ery. Stocky, with spiky blonde hair and a gold earring, he has tat­toos on both arms. One reads: "Live the dream." The other is one word: "Passion." Since com­plet­ing a seri­ous stint in rehab (the last of sev­eral) almost eight years ago, those have been his mantras. And, although he admits the crav­ings are always wait­ing in the wings, he's clean and dry. Thuet has done it all: mar­i­juana, heroin, opium, cocaine, Oxy­Con­tin, alco­hol -- and in mind-boggling amounts -- for about 30 years. He nearly over-dosed more than once but is here, feisty and going strong, to tell the tale. In recov­ery, he has starred in a real­ity TV series called Con­vic­tion Kitchen in which he and his lively part­ner Biana Zorich employed and tried to help ex-cons, mostly addicts, in their for­mer restau­rant. The cou­ple cur­rently own and oper­ate a cater­ing company/bakeries called Petite Thuet in down­town Toronto. Sit­ting in my liv­ing room, Thuet explains why he is will­ing to talk about some­thing many would find shame­ful. "Maybe I can help one or two peo­ple to know that life is beau­ti­ful and worth liv­ing," he begins. Then, refer­ring to the intri­cate way he self-medicated for all those years: "I never thought I had a prob­lem. I used to live my life through chem­istry." That life, he adds, was "chaos." "I didn't sleep a lot. I par­tied a lot. But, at the same time, I worked a lot. I never missed work because of my addic­tion." He was obsessed, com­pul­sive and indif­fer­ent to oth­ers: "If I got a neg­a­tive reac­tion, I didn't care." Even­tu­ally, he wound up in a dark place. He had been using drugs for sev­eral years, unbe­knownst to Biana. She finally found out and kicked him out. "I was depressed, had sui­cide thoughts -- it's the same for every addict. If you don't hit rock-bottom, you're not ready." Thuet has five off­spring includ­ing two young daugh­ters with Biana. The lat­ter keep an eye on him. "My kids know daddy doesn't drink, doesn't smoke weed. A lot of wait­ers in the city know; they bring me a diet Coke." His biggest worry while in rehab was that he would lose his cre­ativ­ity as a chef with­out the drugs. "I couldn't wait to come out and cook again. My inse­cu­rity at that time was huge." The first dish he made with­out the aid of sub­stances was a sole souf­fle with caviar. The ver­dict: "it was excellent." As he leaves, I thank this lovely man for our chat. His reply: "My young daugh­ter says, 'Daddy, you're like a pineap­ple -- prickly on the out­side and sweet inside.'" British chef Michael Quinn spoke to me recently by phone from his home in York­shire. He is using his tragic 30-year descent into alco­holism and the lessons he's learned dur­ing almost two decades of sobri­ety to help oth­ers in the hos­pi­tal­ity indus­try via his foun­da­tion called ArkGlobal. In the early 1980s, Quinn was at the height of his game. He was head-hunted to be exec­u­tive chef of the high-end Ritz Hotel in Lon­don. He was the first chef to receive an MBE from the Queen at Buck­ing­ham Palace. He trav­elled the world as a celebrity and earned the nick­name "The Mighty Quinn." But, as he says: "There's another side to the story." His addic­tion to alco­hol even­tu­ally cost him every­thing and he wound up los­ing his fam­ily and job­less -- a home­less drunk hang­ing out with criminals. Work­ing in a pro­fes­sional kitchen made it easy to slip into addic­tion, espe­cially with a fam­ily his­tory of alco­holism along with "an over-sensitive nature and a per­fec­tion­ist streak" that he claims are pre­dis­po­si­tions. For him, alco­hol was the chem­i­cal "that filled the hole in the soul and was the miss­ing part of the jigsaw." From a social way to unwind after work, drink­ing became a daily rou­tine from day­break to day's end. He cites "wind-down drink­ing after ser­vice" as "the spring-board for many into full-blown alcoholism." In those days, Quinn explains, "all kitchens had a beer allowance called sweat pints." For a long time, he was "a drink­ing alco­holic -- a stand-up drunk. I was a work-hard, play-hard char­ac­ter. And, like most alco­holics, I denied I had a problem." But, as for most alco­holics, drink­ing even­tu­ally caught up with him when he crossed "that invis­i­ble line." Quinn took his first drink at 18 and his last one at 49. By then, he was admit­ted to hos­pi­tal and diag­nosed with end-stage liver fail­ure. He was given the last rites. "That's when I had an amaz­ing spir­i­tual expe­ri­ence. My life changed in a flash and I was placed on the road to recovery." Quinn has been "free from the obses­sive com­pul­sion" ever since. He cred­its Alco­holics Anony­mous for much of that. Mean­while, his full-time mis­sion is to help oth­ers by tak­ing his mes­sage to col­leges, uni­ver­si­ties, hotels and restau­rants. "The only way to get around this," he says, "is to edu­cate young peo­ple and to spell out the warn­ing signs. It's like plant­ing seeds." Fore more, listen to the 3-part podcast series.